Sumerpur is a town in the south part of Pali District 25 km from Bali. The town is headquarters of the Sumerpur revenue subdivision, and Sumerpur Tehsil. Sumerpur is an important agricultural mandi for Pali, Sirohi and Jalore districts. Sumerpur is located at the eastern side of the Thar Desert, on the right (north) bank of the Jawai River. The Jawal River is an intermittent that runs during monsoon season, and is tributary to the Luni River. Jawai Dam is situated at about 10 km from the Sumerpur. The Sumerpur Township covers an area of 500 km². Sumerpur is famous for its Daal Bati and Churma. It is found at most of the occasions whether it be marriage or festival. Sumerpur is one of the biggest markets for mustard seed. Cotton and chilies are exported from Sumerpur. Ghee making is a cottage industry of the town. Other major industries of Sumerpur are iron and wood works. Sumerpur is known in Rajasthan for its ornamental iron works, which produces articles such as iron furniture, gates and railings. Almost all the work is organized in the form of small-scale industries, whereas, automobile retailers sales a lot over the areas near the town. There are 67 villages in the tehsil under 29 Gram Panchayats. The Gram Panchayats of the tehsil are Arenpura, Bamnera, Bharunda, Palri, Korta, Pomawa, Koliwara, Netara, Bankali, Khiwandi, Novi, Sindroo, Balupura, Dujana, Balana, Sanderao, Gogra, Koselao, Kheemara, Pava, Basant, Dhana, Beerami, Deotara, Lapod, Dhola Jagir, Anoppura, Salodriya and Chanod. Takhatgarh and Sumerpur itself are municipalities in the tehsil. Sumerpur Tehsil has a Panchayat Samiti, as well as being the Sub-district Office with the same name. The Sumerpur legislative assembly constituency is constituted of Sumerpur Tehsil and part of the Pali Tehsil. Present MLA of the Sumerpur is Madan Rathore. Friday, 26th August: Students practiced for U17 Football tournament. Students will go to Rani to participate in the U17 Football Tournament. Saturday, 27th August: School’s Girls Football Team escorted by Mr. Tarun Mishra and Ayesha Tak went to Rani to participate in the School Level U17 Football Tournament which was organised by Heritage Girls School, Udaipur. Seven schools participated in the tournament. First match was played against MLPS, Udaipur and school team lost by 2-0. They played second match against Central Public School, Udaipur and won by 4-0. Now they were qualified to play quarter final where they played against Central Public School, Udaipur and won by 2-0. They qualified themselves for Semi-Finals and will play against Heritage Girls School. 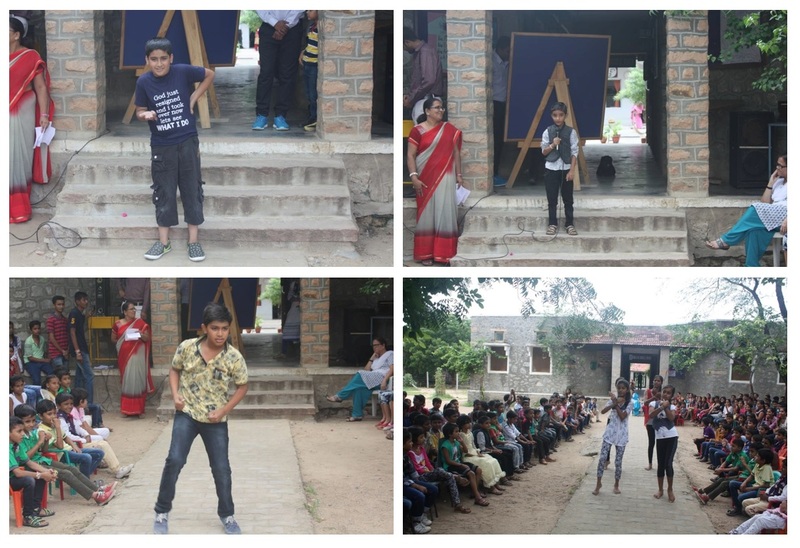 Friday, 26th August: Assessment of Speaking and Listening (ASL) was conducted for Class IX students. They gave a topic presentation of their own choice, on which questions was asked by the teacher. Then problem-solving task was given in pairs to the students. They discussed with their partner and gave suggestions to resolve it. For Listening Assessment a recording was played. Students listened to it and answered their question paper. Saturday, 27th August: ASL was conducted for Class X students. Teachers were busy in finishing their syllabus and taking revision for the commencing SA I in September.